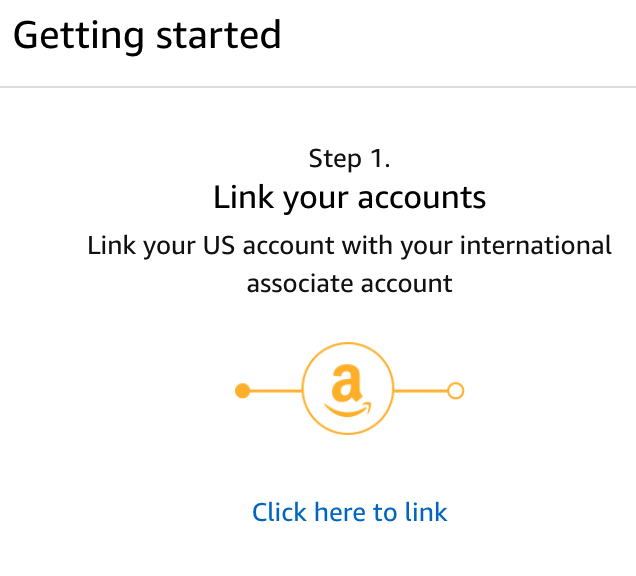 If you use Amazon’s text links, you can now better monetize international traffic coming to your website from the United Kingdom (UK), Canada, Italy, France, Spain, Germany, Japan and neighboring countries. OneLink is a one-time setup and enables you to configure this functionality on your website with six easy steps. 1. You will need an Amazon Associates account in each country for which you want to monetize the traffic. Sign up using the links below if you do not already have an existing account. 3. Click on ‘click here to link’ to map your US/UK, US/CA, US/IT, US/FR, US/ES, US/DE and US/JP account. 4. The ‘link your account’ screen will open, and you can select your geography(s) to map with your US account by entering your UK/Canada/Italy/France/Spain/Germany/Japan account details. 6. 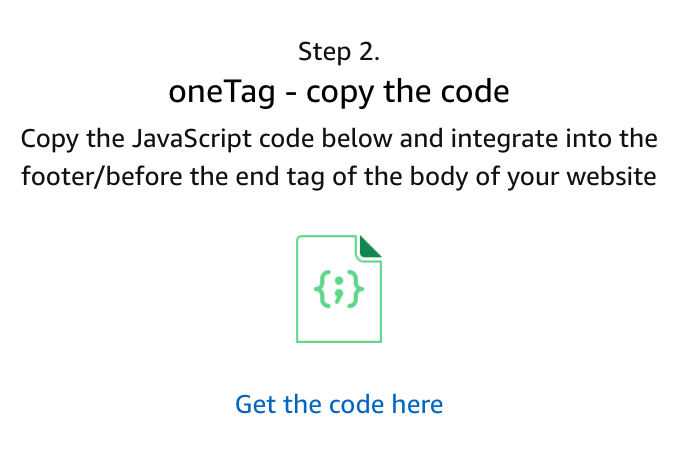 Copy the oneTag script that appears in the box and place it in the footer of your site(s). Now you are all set to start monetizing your international traffic from these seven countries. If you are a WordPress user, click here to view the Integration Guide for WordPress. You have the option to set ‘Close Product Match’ (default) or ‘Exact Product Match’ as your redirect preferences. If you choose the Close Product Match preference, we will redirect your international visitors to their local or nearest Amazon storefront if we find an exact or similar product on Amazon.co.uk, Amazon.ca, Amazon.it, Amazon.fr, Amazon.es, Amazon.de, and Amazon.co.jp, or to the search results page in the absence of a similar product. 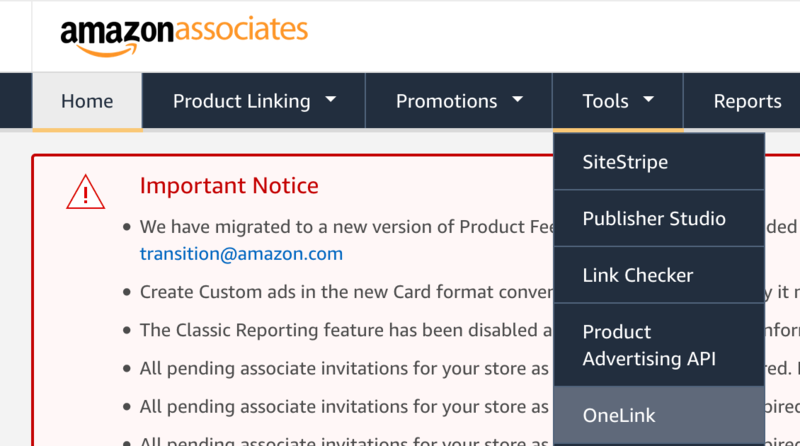 If you choose the Exact Product Match preference, we will redirect your visitors only when we find the same product on the respective Amazon storefront. In the absence of an exact match, we will redirect your visitors to amazon.com. By default, we will set the preference to Close Product Match to increase monetization. Let’s understand this further with an example. Jacob is a publisher who writes about laptops and uses Amazon’s text links. He gets 22% of his overall traffic from the UK, Canada and Europe, and rest from the USA. He chooses ‘Exact Match’ as his OneLink preference. When a visitor from Germany reading an article on his blog on “Why MacBook Pro IS13252 is an ideal choice for web developers” clicks on its text link, he will be redirected to Amazon.de showing MacBook Pro IS13252 with price in EURO if the same product is available on Amazon.de, or the visitor will be led to Amazon US. If Jacob chooses ‘Close Match’ as his OneLink preference, then the same visitor in the example above will be redirected to the same product or a similar product on Amazon.de, or to the search results page in the absence of a similar product on Amazon.de. If you have product-oriented content and want to check which products appear on the UK, Canada, Italy, France, Spain, Germany and Japan storefronts, you can use this tool to verify. Just put the Amazon.com link for the product in the ‘Enter the URL’ box and click on ‘Check.’ The table will show you the corresponding Amazon.co.uk, Amazon.ca, Amazon.it, Amazon.fr, Amazon.es, Amazon.de and Amazon.co.jp links. You can check this for up to 20 links.